It wasn't until 10 years ago that all 50 states observed Martin Luther King Jr. Day. A sad fact when you'd like to think how far we've come since MLK Jr. was assassinated in 1968. I went to Indiana University, located 15 minutes South of where the KKK was founded in Martinsville, IN. Even we had MLK Jr. Day off, despite the fact that the school doesn't like giving days off (my first day of college classes was on Labor Day). You want to say our country has come a long way, and it most certainly has. Yes, there are still people out there that try to impede racial equality. It will hopefully always improve, but some say it may never change. There are positives to focus on, like the fact that Barack Obama is our president, something that would not be possible without the likes of MLK Jr.
MLK Jr. Day is an opportunity to make sure that racial equality continues to be celebrated and improved. 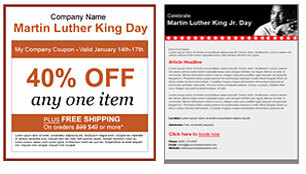 Use Benchmark's Martin Luther King Jr. Day email templates and remind your subscribers of the many great things that MLK Jr. was able to accomplish. Honor him on this day, and all others. Make sure his efforts will never go for naught. For more January and event email templates just click on the link.